Today in my A to Z trip through December, we are on V! To check out the earlier posts, click here! V is for Visitors! I love inviting friends and family to my house before Christmas! There is something sparkly and wonderful in the air... Magic! And I want to share that with the people I care about! 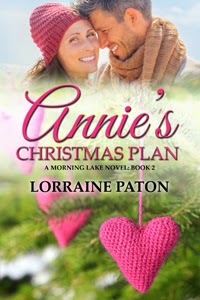 In Annie's Christmas Plan, Annie gets some unexpected visitors to her house during the holidays, too! The day the last present was painstakingly wrapped and placed under the tree in the living room, she wandered through the house with an empty heart—all of this effort and no one was here to enjoy it. Christmas was still days away, and a decorated house should be shared. Good friends, good food, goodwill toward men and all that. She put on one of Bing's Christmas albums and sat back. All she needed was a nice glass of Merlot and a friend with whom to talk. No! No Merlot. The only person who kept coming to mind was Quinn, and he was the last person she ought to call. Sure, they'd shared an hour or two of coffee conversation and he'd helped finish a few small projects around the house over the last few months, but she couldn't help but feel he had disappeared like a dollop of whipped cream on hot chocolate after their kiss at Thanksgiving. The twinkle in his eye, which had been so prevalent in the days leading up to Thanksgiving, had vanished, and oh, how she missed it. She'd messed things up between them by kissing him. The idea of calling him took root, and was rather insistent about not being ignored. What would he think if she called him? She had to try. She grabbed the phone and dialed his number before she lost her nerve. No answer. She left a message on his voicemail. Immediately after she hung up, she hated herself. A minute later, the phone rang. "You called?" Quinn's voice was muffled by noise in the background. Wherever he was, people were having fun. "I was wondering if you wanted to come over for some Christmas cheer." How desperate did she sound? After what seemed a gaping chasm of awkward anticipation, he cleared his throat. "Sure, when?" "Whenever you like." Desperate again. Shoot. "We're at Cathy and Chris's place, up the road from you. I don't think you've met them yet." "Well, at Christmas we sometimes go around to a few houses and—" His voice disappeared. "Hello?" Another voice—a woman's—came on the line. She never should have called. "You're Annie, right?" the woman asked, but she didn't wait for an answer. "We'll be over in a bit." Then the line went dead. We? In a bit? Did that mean right now? She jolted off the couch and dashed into the kitchen. People were coming. Her neighbors, her new community members … strangers would be at her house tonight. What did she have to serve? Nuts? Cheese and crackers? Veggies and dip? Little Christmas oranges? Chocolates? Thankfully, she had already bought some groceries for Christmas. Rushing through the kitchen from pantry to cupboard to fridge, she tossed food on plates and serving trays. Please let there be enough for a group. Of course, she had no idea how big of a group to plan for, but they would have some morsel at least. When the first set of headlights appeared in the drive, her whirlwind ceased. She set the bowls and platters out on the table before rushing to the door to greet the first arrivals. When Quinn strode into the light, her heart skipped. Their kiss was foremost in her mind. Behind him, others exited his truck and then more trucks and cars came into the drive. Annie couldn't believe it. Her yard was filling with a little convoy of Christmas celebrators. Do you enjoy entertaining at this time of year?